You deploy a SCCM task sequence and it fails with error 0x80070002. However the smsts.log file shows error 80190191. We know that 0x80070002 is a generic error and there can be multiple reasons for this error. While you see a generic error code, you cannot conclude anything here. You need to examine the smsts.log file to understand at what step the task sequence actually failed and the reason for it. Last week one of the user contacted me about this error. He mentioned that the task sequence failed at Apply Operating System step. The task sequence failed with error code 0x80070002. The first thing that I suggested him is to check the smsts.log and ensure the network access account is configured. 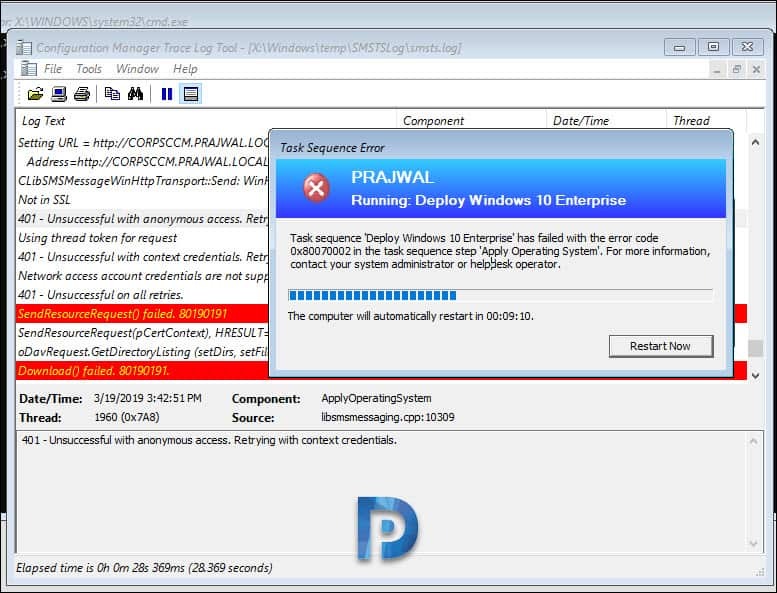 In this post I will provide a solution for SCCM OSD error 80190191. If the solution doesn’t work for you, do mention in the comments section. What is Network Access Account ? The Network Access account is used only for accessing the content and not for running the task sequence. This account should have the minimum appropriate permissions on operating system deployment content it needs to access. This account is important because the computer receiving the operating system does not have a security context it can use to access content on the network. Click Administration > Overview > Site Configuration. Click Sites, on the top ribbon click Configure Site Components and then click Software Distribution. Under Software Distribution Component Properties, click Network Access Account. Select Specify the account that accesses network locations. Specify network access account. Here is a video tutorial to create network access account in SCCM. Typically an error 80190191 occurs if any of the below conditions are true. The Network Access Account isn’t configured correctly. Missing IIS components on the site server. Here is the snippet of smsts.log file. 401 - Unsuccessful with context credentials. Retrying with supplied credentials. Network access account credentials are not supplied or invalid. 401 - Unsuccessful on all retries. Most of all, you see SCCM OSD error 80190191 because the network access account isn’t configured correctly. If you are not sure about that account, you may remove it and create a new account and add it. In very rare case, you might need to verify the second reason for this error. If you see Download failed error 80190191 in smsts.log file, it could be due to Windows Authentication missing on the server. In such cases you must examine the IIS logfiles and double check if IIS is configured as per the actual requirements. Install the missing components on the distribution point server and the error should not appear again. Amazing troubleshooting post, thank you Prajwal..